SYNOPSIS : Entrusted by NEDO.IGC Research Association has conducted the R & D of an IGCC power system from 1986 to 1996. Nakoso IGCC pilot plant is composed of an air blown gasifier, hot gas cleanup facilities and a gas turbine for low Btu coal gas. After its mechanical completion in March 1991,test operation of the plant was started gasifying a domestic and two Australian coals. Overcoming various difficulties such as the slagging in the gasifier, cumulative operating hours of the gasifier exceeded 4,700 hours, including the continuous operation of 789 hours. Almost all of the results such as the HHV of the product gas,cold gas efficiency of the gasifier, desulfurization and dedusting efficiencies of the gas cleanup facilities and load following capability of the plant, are satisfactory to the target value. As coal is widely distributed throughout the world and its deposits are abundant, development of high efficiency coal utilization technology is expected to play an important role in Japan for the stable supply of energy resource substituting oil or natural gas. Especially�uIntegrated Coal Gasification Combined Cycle Power System�v,which integrates the coal gasification technology and combined cycle power generation technology (combination of gas turbine and steam turbine),is the most advanced coal utilization technology and is expected to constitute a major portion of coal fired power plant at the early stage of the 21st century. After the twice of oil crisis, discussion on the energy policy has been conducted energetically both in the governmental organization and in private sectors .And the development of advanced thermal power generation technology with high thermal efficiency and superior environmental compatibility was strongly requested. Further, based on the result of the feasibility study of�uIntegrated Coal Gasification Combined Cycle Power Generation Technology�v(entrusted by New Energy and Industrial Technology Development Organization or NEDO to Central Research Institute of Electric Power Industry or CRIEPI and conducted from 1983 to 1985) ,MITI related committee had a discussion on this technology and targets for technical development of the pilot plant were determined. Meanwhile, electric utility companies had conducted a few years of investigation on coal gasification, organizing a subcommittee in the R&D division of the Federation of Electric Power Companies in 1980. Based on the result of the investigation, an IGCC system integrating entrained flow gasifier, hot gas cleanup facility and 1,300�� class gas turbine for low Btu gas was adopted and unit size of 200t/d coal consumption ( corresponding to approximately 1/10 of the next step 250MW class demonstration plant which has the target of 43% net thermal efficiency) was also determined. Thus,�uEngineering Research Association for Integrated Coal Gasification Combined Cycle Power Systems (current chairman : Shige-etsu Miyahara)�v,comprising 11 entities ( 9 electric power companies, EPDC and CRIEPI) was established in 1986 and, financially supported by MITI and entrusted by NEDO , research and development of an IGCC system with 200t/d entrained flow pilot plant (referred to as PP, hereafter) in the premises of Joban Joint Power Co.'s Nakoso Power Station was initiated in 1986. 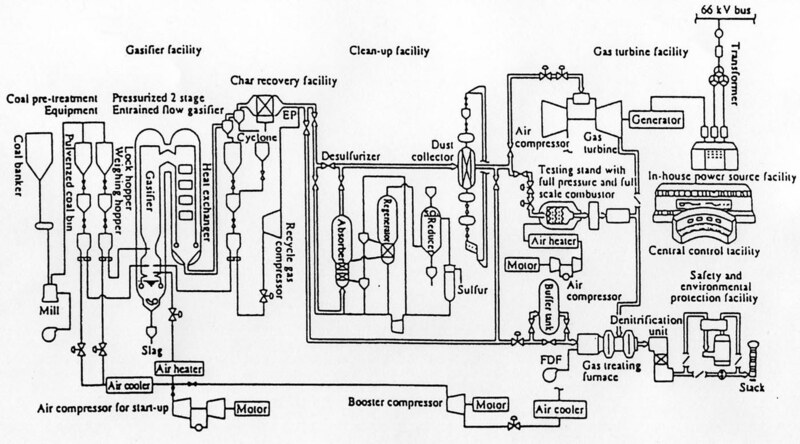 A schematic flow diagram of the Nakoso pilot plant is shown in Fig.1.Main target of this plant is the R&D of an IGCC system composed of an air blown, pressurized two staged entrained flow gasifier, hot gas clean-up facility and low Btu gas fired gas turbine. And this plant is aiming at achieving higher thermal efficiency than the similar plants in the world, employing unprecedented unique system. As this pressurized two staged entrained flow gasifier uses air for gasifying agent, installation of large air separation unit, which is indispensable in case of oxygen blown systems, can be avoided. Coal consumption is 200t/d and gasifier pressure is 27ata. Main component of the product gas is CO and H�Qwith the heating value of around 1,000kcal/m�RN. Char in the product gas is recovered and recirculated to the combustor chamber of the gasifier. Ash in the coal pours into the bottom of the gasifier through slag tap as molten slag. And contacting with water at the bottom of the gasifier, it is quenched and granulated to form glasslike pellets .It is then discharged out of the gasifier. As the gas cleanup facility is composed of unprecedented hot desulfurization and dedusting units ,product gas is supplied to gas turbine at about 400��,resulting in higher thermal efficiency compared with the system employing wet gas cleanup facility. Desulfurization facility is composed of desulfurizer and regeneration system(regenerator, reductor etc.). Fe�QO�R is used as sulfur sorbent and sulfur in the product gas reacts with the sorbent at the fluidizedbed, forming FeS. FeS is then reacted with air at the regenerator to form Fe�QO�R(for reuse) again .SO�Qin the exhaust gas from the regenerator is recovered as elemental sulfur by reacting with anthracite at the SO�Qreductor. Granular filter having 4 layers( 2 layers�~2 units) in the vessel is used as dedustor. Synthetic mulite granules is adopted as filter medium and the granules capture dust in the product gas by moving slowly downward in the filter panel. Dust is then separated by vibrating sieve outside of the system and the synthetic mulite granules are reused by recirculation. �@�@ And the tests were conducted jointly by the manufacturers and IGC Association. 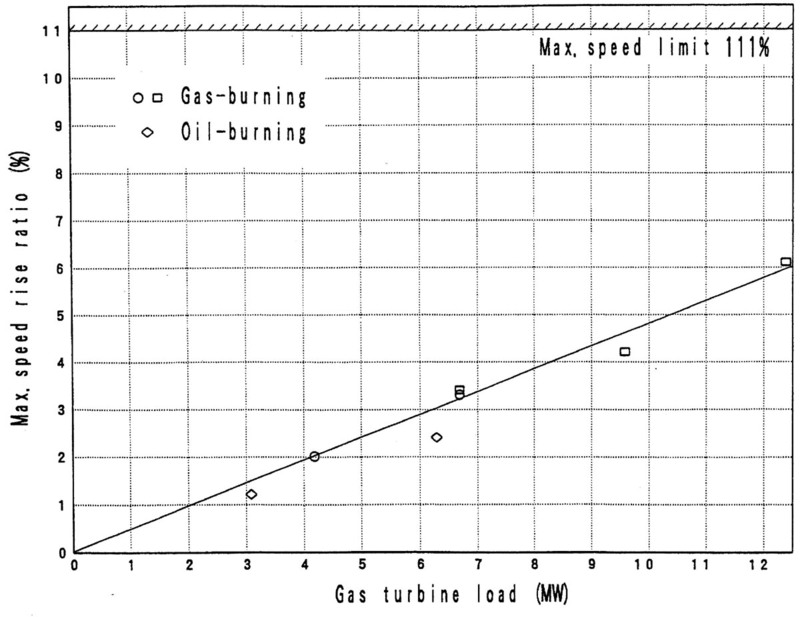 The gas turbine was developed aiming at burning low calorie gas of around 1,000 kcal/m3N (approximately 1/10 of LNG ) stably maintaining the same level of combustor outlet temperature with GT for LNG. This gas turbine is a simple cycle type having six conbustors of 1,260�� conbustor outlet temperature and the generator output is 12.5 MW. A unique constitution of this power system is that air compressor, which is directly connected to the gas turbine, is equipped with air extraction device in order to convey air to the gasifier as gasifying agent. Further, test stand for a full pressure and full scale combustor, one can of combustor for demonstration plant scale gas turbine(175MW),is installed in order to conduct tests on stable combustion, high cooling efficiency, NO�w emission level, etc. Steam turbine is omitted in the Nakoso pilot plant, as it is the state of the art technology and there is almost no R & D items in the system. Flammable coal gas treating furnace (incinerator),flue gas denitrification (SCR) unit and wet flue gas desulfurization (FGD) are installed to treat flue gas prior to entering the stack, considering various operation modes such as gasifier alone operation, gasifier+gas cleanup operation, gasifier+gas cleanup+gas turbine operation etc. Outline of the R&D schedule is shown in Fig.2. Adjustment operation of the Nakoso pilot plant was started in March 3,1991 by igniting the oil burner. In June 1991 first coal gas was generated from Taiheiyo coal and in February 1992 product gas was introduced to the gas cleanup facility. In July 1992, power was successfully generated for the first time by the IGCC system employing air blown entrained flow gasifier and hot gas cleanup system. Afterward, twice of plant modification was conducted to solve the slagging problem of the gasifier. From March 3 to April 4,1995,long term reliability evaluation test using Moura coal (see Table 2) was conducted,achieving 789 hours ( 33days) of continuous operation. Cumulative operation hours of each facilities during 5 years from June 1991(first Btu) to February 1996(final run) are shown in Table 1. Profile of cumulative operation hour is shown in Fig.3. �Z�@Coal feed system, gasifier (reaction zone),gas cleanup system, etc. are under high pressure of 26ata. �Z Valves and pipes in pulverized coal systems and char recovery system,and compressor for char transportation must treat fine powdery materials. �Z Ammonia in the raw product gas brings about unfavourable effect on the sulfur regeneration system. �Z Redundancy of the plant is minimized ,as this is the R & D facility. Major troubles caused by the above mentioned causes are described below. Accompanied by the elongation of the gasifier operation hours and the increase of gasifier load, slag deposition at the reductor section of the gasifier became evident as shown in Fig.4,forcing the gasifier to shut down during operation. As a countermeasure for this trouble, low temperature water cooled panels were installed on the gasifier during the plant outage from the middle of April to towards the end of July 1993. However, slagging trouble was not completely solved. Then, investigations to clarify the slagging mechanism had been conducted using CRIEPI's 2t/d pressurized gasifier, MHI's 8 t/d atmospheric pressure gasifier and cold model, etc. Outline of the slagging mechanism is described below in reference to Fig.4. Pulverized coal is injected into the gasifier through 2 ports, namely combustor chamber and reductor section. At the combustor chamber, pulverized coal and char (unburned carbon) burn producing over 1,500�� of high temperature gas which then go upward to the reductor section and gasify pulverized coal there. Simultaneously, in the combustor chamber, molten coal ash at the high temperature is conveyed to the wall and upward there by the swirling force caused by the tangential burner angle and the captured slag then flows down. When the swirling force is too strong, part of the molten slag is pushed upward of the combustor chamber. And in case of high gas velocity (high dynamic pressure) at the " throat section", molten slag is further conveyed upward which then combines with the pulverized coal injected at the reductor section and, sticking (depositing) on the wall surface in the transition gas temperature zone, it is calcined there. Thus, following 4 items seems to have strong influence on the slagging phenomena. As there is no countermeasures to item �Aand �B,various countermeasures to �@ and �C had been investigated. 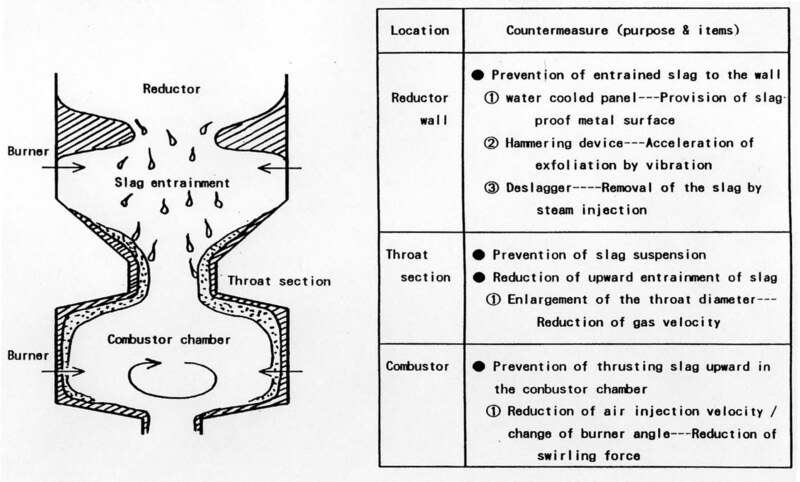 And as shown in Fig.4,various modification of the gasifier, including the widening the diameter of the gasifier to reduce the gas velocity and dynamic force at the throat section of the gasifier, was conducted during the period from June to November 1994.After the modification of the gasifier, it become possible to operate continuously without any deposition of slag. Further, at the last stage of the operation of the Nakoso pilot plant, the plant was operated without any indication of slagging, even after dismantling the low temperature water cooled panel (and the panel hammering device) which had been installed as a countermeasure of slagging. Judging from the above mentioned results, the effect of widening the diameter of the throat section was dominant. Rotating table feeder type equipment is employed for the weighing of pulverized coal. However, disadvantageous phenomenon of sudden over feeding of coal was found in this feeder, when the quantity of remaining coal in the weighing hopper was small. As a countermeasure, prism like structure was installed in the hopper to assist smooth falling of coal into the hopper. However, this overfeeding phenomenon did not completely disappear. So, practical countermeasure of increasing the minimum inventory of pulverized coal in the hopper was adopted. However, it was somewhat difficult to determine the minimum value, considering the adverse effect of increased coal accepting frequency. Comparative study of coal feed system should be conducted and the system for the next step "demonstration plant" must be selected after the verification of the selected system. Air and the recycle gas (product gas) are used for transporting pulverized coal and char, respectively. As the plugging of the transportation pipe caused by the moisture content of the recycle gas was experienced from time to time, it is recommended to adopt a transportation system using pressurized nitrogen in both transportation lines. At the early stage of Nakoso pilot plant operation, heating value of the product gas from the gasifier occasionally fell below 900kcal/m�RN, causing unstability of combustion and flame out of gas turbine. At the latter part of test period, oxygen equivalent to the amount produced as a byproduct of nitrogen production was added. Heating value of the product gas was then raised by 100-150kcal/m�RN and it was maintained above 1,000kcal/m�RN. In the demonstration plant, nitrogen will be used for transporting coal and char and the oxygen produced as a byproduct of nitrogen production will also be utilized to enrich air. NH�R,produced by the decomposition of nitrogen compound in coal and HCl produced by hydrolysis of chloride such as NaCl, are present in the product gas. Entering the secondary system of gas cleanup (regeneration - SO�Q�@reduction) ,they deposit at the inlet section of the sulfur condenser of 300-350�� temperature zone forming ammonium chloride (NH�SCl),which then causes plugging of the sulfur condenser. By recirculating high purity liquid sulfur, surface of the condenser tubes were coated by sulfur and the period till the plugging of the tube was markedly extended. However, washing the gas by water would be necessary as a final countermeasure. Further, in the demonstration plant, recovery of sulfur as gypsum would be preferable to the recovery as elemental sulfur, considering the marketability of the byproduct (surplus sulfur is in the market because of decrease of sulfur content in gas oil). Test operation of the pilot plant was started immediately after the mechanical completion of the plant at the end of February 1991. And the first coal gas was generated in June of that year. Although various difficulties such as the plugging of the slag hole and slagging of the diffuser /reductor section of the gasifier were encountered during test operation, they were perfectly solved by modifying the profile of the gasifier. Tests on three coals(domestic Taiheiyo coal, Australian Moura and Warkworth coals) were energetically conducted in 1995 and satisfactory operating data were obtained. By the way, in order to secure stable combustion of the product gas at gas turbine, small amount of oxygen was added in the secondary air of the gasifier and in the case of Australian coal powdery limestone was added in the coal as fluxing agent. Plant performance tests were conducted on three coals and data were obtained at the rated capacity and partial loads. 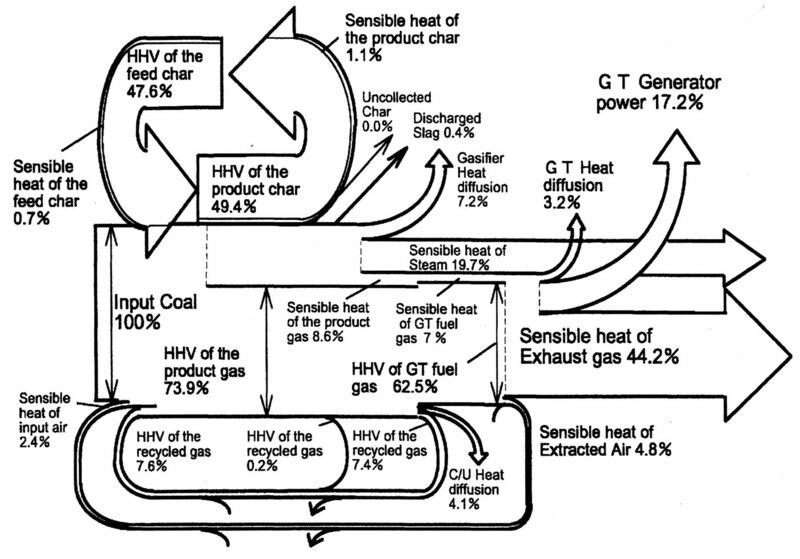 Example of the heat flow at the gasification of Moura coal is shown in Fig.5. Carbon conversion efficiency(amount of carbon in the product gas flow /amount of carbon in the input coal flow) was over 99%,exceeding the target value (98%<). Residual unburned carbon in the discharged gasifier was found to be less than 0.1wt%. 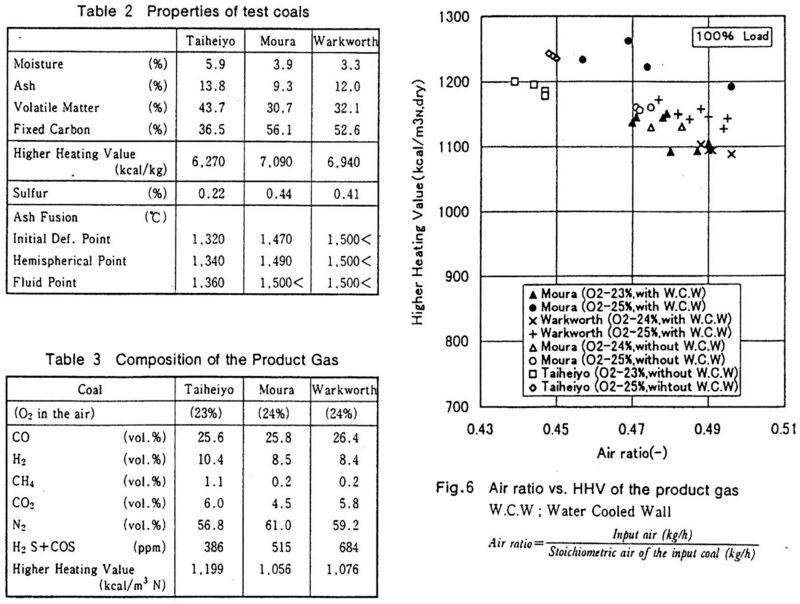 Properties of test coals and composition of the�@product gas are shown in Table 2 and Table 3, respectively. Inflammable components of the product gas are CO,H�Q and small amount of methane. Relationship between air ratio and heating value of the product gas from Taiheiyo coal, Moura coal and Warkworth coal is shown in Fig.6. 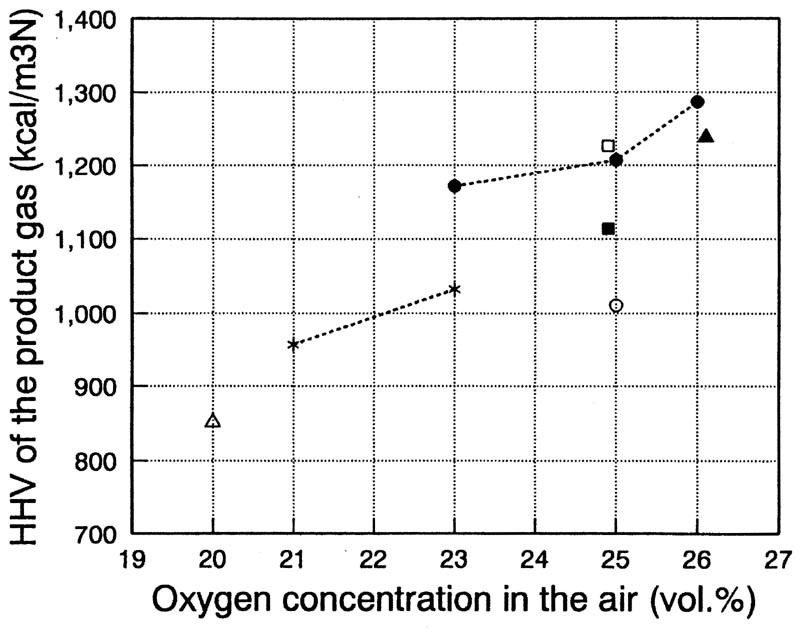 Data with oxygen concentration of 23-25% ( in the input air) are shown in this figure. In addition, data with and without low temperature cooling panel (provided at the reductor section to prevent ash deposition) are also shown. In any case, heating value of the product gas increased in accordance with the decrease of air ratio. At the same air ratio, the higher the oxygen concentration in the input air, the higher the heating value of the product gas. Heating value of the product gas with the low temperature cooling panel is generally higher than that without the panel. This phenomenon might be caused by excess feeding of char than the amount of char produced in the gasifier. 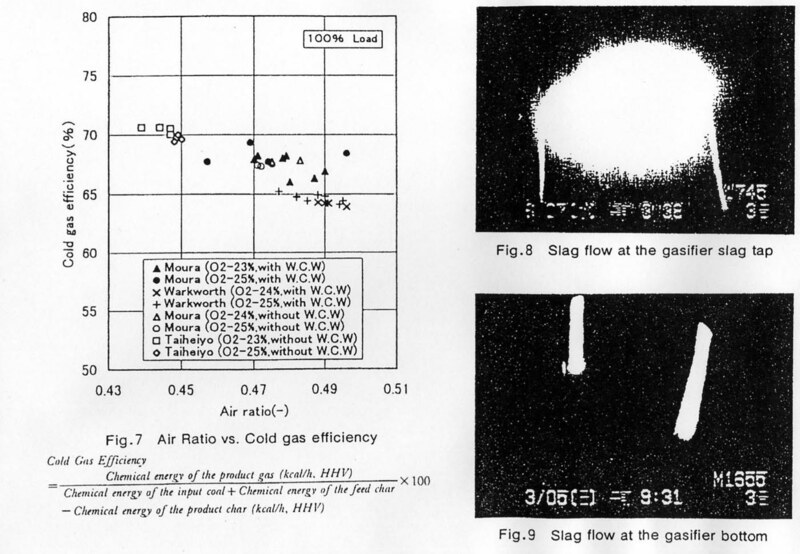 Relationship between the air ratio and the cold gas efficiency is shown in Fig.7. Same as in the case of heating value of the product gas, data with oxygen concentration of 23-25%( in the input air) are shown in this Figure. As mentioned above, amount of char formation and feed amount was not in good balance. Therefore we defined " cold gas efficiency' as shown below, correcting the char imbalance. Cold gas efficiency is improved by the decrease of air ratio and it was 66-71% in the case of Taiheiyo coal and Moura coal and 64-65% in the case of Warkworth coal. No significant difference was observed between the case of with and without low temperature water panel. Addition of flux(CaCO�R) is effective in gasifying Australian coal. By adjusting CaO content of ash to 10-20% ,sufficient fluidity of the molten slag was maintained and the slag flowed down stably. In the case of Taiheiyo coal, having low ash fusion temperature, sufficient fluidity was maintained without flux. Slag flow at the slag tap and gasifier bottom in the case of flux addition are shown in Fig.8 & 9 respectively. Heating value of the product gas increases by the enrichment of air (gasifying agent) with oxygen. Relationship between oxygen concentration in the input air and the heating value( HHV) of the product gas is shown in Fig.10. During the initial stage of test operation, gas cleanup facility was independently operated using recirculation line. And adjustment operations were conducted using raw product gas from gasifier since February 1992. Although some problems such as plugging of sulfur condenser were encountered, solutions were found and the expected performance of desulfurization and dedusting were confirmed. As all of the three gas cleanup facilities (main pilot plant, fixed bed type and moving bed type) uses iron oxide as sulfur sorbent, nearly the same desulfurization efficiency were attained at normal operation (inlet sulfur concentration : 400-1,400ppm). 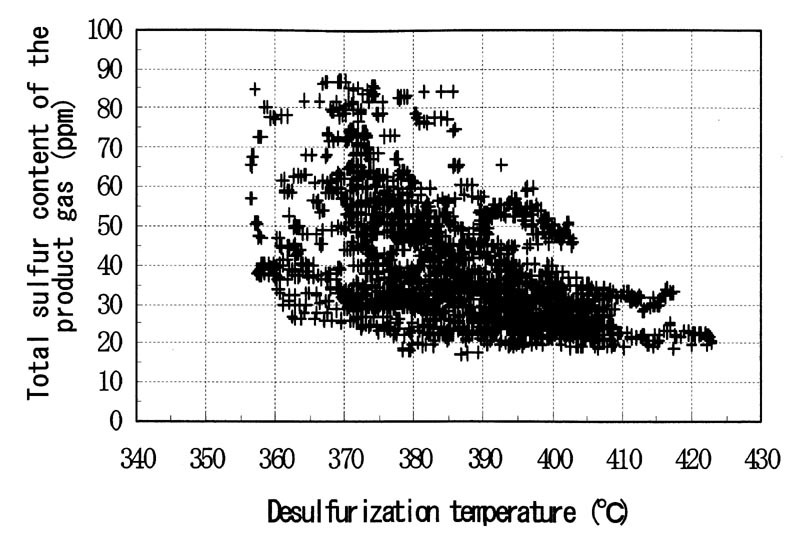 Desulfurization efficiency sharply drops at the outside of the appropriate temperature range. Therefore target concentration of sulfur (H�QS+COS) at the desulfurizer outlet was determined to be 110-100ppm taking into account the temporary temperature drop during the load change. However, at the rated capacity, total sulfur concentration of 25ppm (close to chemical equilibrium) was expected. As indicated in Fig.11(test result of main pilot plant), around 30ppm of satisfactory sulfur concentration was attained at the temperature above 400 ��. As shown in Fig.12,regeneration efficiency of the sorbent was 87-98% at the regenerator temperature of 580-730��. In this temperature zone with sufficient oxygen injection ,no sulfate formation was found and the sulfidation ratio of the sorbent was constantly less than 1.0%. At the fixed bed system regeneration temperature was approximately 600��and the regeneration efficiency was estimated (by the gas composition) to be over 80%. At the main pilot plant,SO�Q rich (approx. 4%) product gas from the regenerator is reduced by anthracite and 20-45% of SO�Q was converted to elemental sulfur. Favourable operating temperature of the SO�Q reductor is 650-700��. Below this temperature range,reduction of SO�Qto elemental sulfur is decreased and above this temperature zone reduction of SO�Q to H�QS and COS is enhanced and in both cases reduction efficiency is decreased. In the fixed bed system,reduction of SO�Q from the regenerator (0.5-1.0%) is conducted using a part of the product gas. And 76-96% of high conversion efficiency was obtained, as this is a gas-gas reaction on catalyst. As shown in Table 4,dust concentration at the inlet of the dedustor of the main pilot plant was approximately 1/10 of the design value because of the fact that the dust concentration of the raw product gas at the outlet of the gasifier was far less than the design value (3g/m3N) and considerable portion of the dust is removed by the upstream desulfurizer. 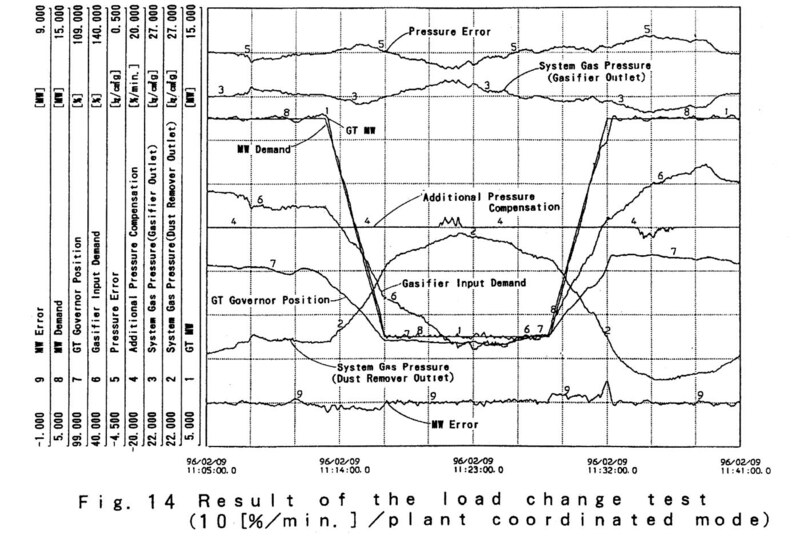 Consequently dust concentration at the outlet of the dedustor was around 2 mg/m3N,far below the required value from the gas turbine side ( less than 30 mg/m3N ). At the moving bed type system utilizing the same principle ,similar dedusting efficiency was attained. At the fixed bed type system adopting ceramic filter, dust concentration at the dedustor outlet was less than 1 mg/m3N ,sufficiently satisfying the target value of 10 mg/m3N. Gas turbine is designed to start up firing gas oil and the fuel is switched over from oil to coal gas at 25% load. First power generation firing coal gas was conducted in July 1992. At the initial stage of test operation, heating value of the product gas from the gasifier fluctuated considerably and flameout of the gas turbine occurred from time to time. Based upon these experiences, lower limit of heating value for stable combustion at newly developed combustor was determined to be arround 800 kcal/m�RN (LHV, wet ). This figure corresponds to approximately 950 kcal/m3N (HHV, dry),considering the difference of basis and the dilution by inert gas at the gas cleanup facility. After the modification of the gasifier, fluctuation of the heating value of the product gas was minimized and operation of the plant at high load become possible. And performance of the plant at rated capacity ( output : 12.5MW,thermal efficiency : over 28.2%) was confirmed. Further, metal temperature of the liner was below the upper limit (850��), even when the combustion temperature reached the design value of 1,260��. From the view point of safety, it is requested in Japan that that the maximum speed rise ratio of turbine in case of load dump is under the limit value(111%) and the turbine can stably continue operation with no load. Load dump tests were conducted at every quarter load. As shown in Fig.13, satisfactory results (speed rise ratio : 106% at rated load) were obtained. CO concentration of the exhaust gas was around 100ppm after the load dump. In case of cold startup it takes nearly 2days for Nakoso IGCC plant, as the prewarming of the gas cleanup facility and pressurizing the system requires many hours. However it was confirmed that hot restart can be conducted within 8-9 hours. We have two control objectives in the control system of the plant, namely generator output (main requirement for power plant) and process gas pressure ( index of stable operation). Six different control modes can be selected in the integrated load and pressure controller, "plant coordinated mode" being the highest rank mode. In this "plant coordinated mode", all of the air requirement at the gasifier is supplied by gas turbine air compressor, generator output is controlled by the gas turbine control valve and process gas pressure is controlled by the adjustment of gasifier input. Test operation of the integrated load and pressure controller was initiated in January 1994, starting from the tuning of the pressure control loop and tested every control mode shifting from lower to higher modes. In the load change test, load change rate was gradually raised from 1%/min to 2,3,5,6,8%/min with above mentioned plant control mode. And finally 10%/min with load change range of 5MW(40%) was tested. Result of the final test is shown in Fig.16. As indicated in this figure, maximum deviation of the generator output is 1.3% (control target: 5%) and maximum gas pressure deviation is 0.7% ( control target : 1.9%). Thus excellent controllability, higher than the target figure, was confirmed and superiority of IGCC power plant over conventional power plant in terms of power system operation was proved. Conceptual design of the next step demonstration plant ( coal consumption : 1,500�`2,600 t/d )has been conducted since October 1992,reflecting the operation results of Nakoso pilot plant. By adopting most advanced high efficiency gas turbine, thermal efficiency of the demonstration plant is estimated to be over 49% in gross efficiency and 43% in net efficiency, satisfying the target value. Because of the reasons that the capacity of the demonstration plant is smaller than the recent pulverized coal fired plant (around 1,000MW) and that it is the first plant ,power production cost of the demonstration plant is supposed to be somewhat higher than that of the conventional pulverized coal fired plant. Considering the fact that the Nakoso plant could follow 10%/min of load change easily, the demonstration plant equipped with steam turbine cycle would be able to follow the load change of 5�`6%/min. However, as it requires considerably long time for its start and stop, the plant would be considered as base load power plant or middle load power plant. Coal ash discharged from the gasifier of Nakoso pilot plant is in the form of glass like pellets and its volume is nearly one half of that from conventional PC plant. And as it has very small leachability, it is considered as inert waste in case of disposing it for land reclamation. Further, as a result of investigation of gasifier slag utilization, it was revealed that the slag can be used for a substitute material of clay in cement industry and can also be used as fine aggregate for concrete. Development of gasifier for IGCC plant was initiated in 1970s and a great progress was made especially in the last few years ,bringing several IGCC plant in operation. In the oversea technology, oxygen blown entrained flow gasifier and the state of the art wet gas cleanup facility are adopted. However, Nakoso PP system(air blown gasifier, hot gas cleaup facility) is attracting keen attention not only in Japan but also from abroad. There are some items to be cleared such as establishment of scale up technology, verification of scale up technology of the valves and pipes treating powdery materials. After the investigation of those items, construction and operation of the demonstration plant is strongly looked forward in near future. Finally, authors wish to extend our deep and sincere appreciation to ANRE, NEDO, Electric Power Companies, CRIEPI ,and related manufacturers for their instruction and cooperation in preparing this paper.